Decision making in horse racing: Which bets? So many bets, so little money. For horseplayers to succeed, they must be decision makers. Movers and shakers. Doers. 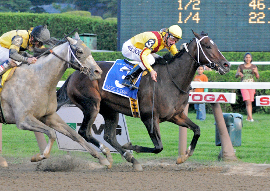 Not only must they solve the unique equation that leads to selecting the right horse(s) in a particular race but they also must choose the right wagering approach in order to maximize their profits. That wasn't such a difficult thing in days gone by when Win-Place-Show were about the only options available. You just picked the best horse, waited for the right price and went to the window. In the modern era of handicapping, however, you not only have to pick the best horse but you then must consider how to play it--Win only, Win/Place, Exacta key, Daily Double key, Quinella key, Trifecta key, Triple key, Superfecta key, etc., etc., etc. About the only thing nobody considers any more is across-the-board which was a pretty popular play back in the 1960's. Handicapping has become a "score" oriented game for the high rollers who can afford to put thousands through the wickets on any given day. They shoot for the Pick Six choosing to single their best play(s) of the day and go deep in the other races, particularly when there is a carryover involved. The reasoning being that they can turn a winning 5/1 shot into a six-digit payday in conjunction with some "contention" handicapping in the other events in the sequence. If they succeed three or four times a year, they win big. This is all well-and-good for the well-healed player who can suffer through the inevitable losing streaks without visiting Tap City. Most of us, however, are not in that category. We're just working stiffs who enjoy playing the races and are looking to supplement our income rather than retire. This look at the existing wagering menu is dedicated to us. Wagering to win on legit contenders going off as overlays is the tried-and-true way to go. You don't have to (in fact, you shouldn't) restrict yourself to your top selection in any race but instead should be willing to back any true contender going off at healthy odds. Not too many bettors end up with a 10/1 shot on top in their handicapping very often but most everyone has second/third/fourth choices that run in and pay $20+ mutuels fairly regularly. Ultimate losers, however, refuse to get off their top choice as an 8/5 underlay in order to back their fourth choice at 17/1 because they prefer the safety of the crowd's thinking over their own. These people can't conceivably win long term which is the basis of 'value' handicapping. How much you bet should be determined by how much you like the horse's chances of winning. If you normally bet $20 on a top-choice overlay, you should probably bet $15 on your second choice and $10 on your 3rd or 4th. If you have more than four contenders in a race, that's an event that should probably be passed. Place betting is expensive insurance. You can never actually win with a Win/Place bet. If your horse runs 1st, you should have bet all your money to win. If your horse runs 3rd or worse, you lose. If your horse runs 2nd, you may have profited from the race, but you still have a right be unhappy since your horse didn't run 1st. Still, insurance companies do a healthy business in this country because of the safety net that is created for people who fear the worst and want to be prepared for disaster. Those making Win/Place bets consistently should do so only when backing horses at higher than 5/1 odds. Bets of this sort do reduce the risk of long, potentially-mind bending losing streaks and allow the player to keep a positive frame of mind by making more trips to the cashiers. If you're a good player, 'Win/Place' will cost you money over the long haul but the peace of mind may be worth it. That's your call. If you're a bad player, it doesn't really matter since you'll just be postponing the inevitable. Everybody still loves the Exacta but they have caused the expiration of many a player as they watched their 10/1 and 15/1 shots get split by the favorite. Essentially, handicapping Exactas requires a different approach to the game. It's necessary to consider horses that don't figure to win instead of just tossing them out. You know, the no-speed plodders, the 0/22's in a maiden race, the low-percentage jocks/trainers, etc. Then, of course, you're also betting on horses to do something their human connections aren't that interested in--finishing 2nd. Most trainers would rather run 3rd (or worse) if they can't win since the horse would figure to come back fresher and more enthusiastic for the next go-round. Nobody wants their stock beat up trying to run 2nd. It doesn't make any sense from the big picture. Exactas are best employed when you truly can't separate contenders on paper or on the toteboard. An exacta box is simply a quick way to make multiple exacta bets. The horses selected in a box must win and run second in either order. For instance, a $2.00 exacta box = $4.00 bet in which we are taking the two horses to come in 1-2 or 2-1. The Quinella can be a nice replacement for the Win/Place bet. Take your top overlay to win and then play it in the Q with two or three good-priced contenders giving you a chance to win both wagers. In this situation, you actually have a chance to make a nice profit if your key runs 2nd, beaten by one of your pricey contenders. Instead of getting an $8 place price, you may catch a Q for $40 or $50 or more. Another positive Q situation is when you're dealing with a favorite that figures to run well at a mini-price and feel there are a couple of longshots in the race that look as good, or better, than the next few betting choices. All the reasons that make Exactas tough to play, make the Trifecta even tougher. I'll tell you what, nobody out there WANTS to run 3rd. There's enough craziness in a race to begin with before you try to figure out what horse is going to stumble into the show dough. If it's a favorite, it's not going to pay anything anyway and your money was better spent in the Win or Exacta pools. If it's a whacko horse, you better have the "all" box on the bottom and that gets expensive. Rolling Pick Three's are best capitalized on when you can find two out of three races in a sequence with suspect favorites or when you have a strong single that doesn't figures to be an overlay at post time. With a $1 minimum wager in many places, you can use two horses in each event for $8 or three horses for $27 which gives you a chance to make a nice score by beating the favorites. However, remember to also play your key horse(s) to win if the price is right in the first two legs because you don't want to blow a nice mutuel should things fall apart later on. With small fields so prevalent locally these days, you can single your short-priced key horse with multiple horses in the other two legs (especially if the favorites are vulnerable) looking to turn an 8/5-shot into a 10/1+ payday. For example, instead of betting $40 to win at puny win odds, take two contenders from one heat and three from another and bet a $7 ticket ($42). If the key wins and you don't hit the Triple, you don't feel as stupid missing a $5.20 mutuel as you would a $22.20 screamer. Once very popular, the Daily Double(s) is pretty much forgotten these days. The "late" Double is more interesting than the early one since you may have a short-priced standout in one of those races and it's gives you an investment option that is better than backing it to win. Hollypark's rolling Doubles also provide a chance to employ that strategy when the other legs of the Pick Three feature a solid favorite or a race that borders on the impossible. IN SUMMARY - JUST TELL ME WHAT TO DO! Now while some of you have been betting the horses for a while and have a strategy that works for you, some of you are relatively new to it. To those who are new and are looking for a simple winning strategy, I'll share my thoughts on a very simple one that you can employ. While some small money can be made by betting horses to win, place and show, I think the most can be made instead by going with exactas and/or trifectas. That's where the real big payouts lie. Unless you have a big bankroll and can "afford" big swings and dry periods, lay off the trifectas. When they hit they are huge but they can get expensive and there can be very long dry spells between hits (it's REALLY hard to pick the top three in order). Wait on the trifectas until you are more experienced and have a big bankroll. For now, focus on exactas. Take 3 or 4 horses for a race and box them in all combinations. For 3 horses, that would equate to 6 exacta bets (1-2, 1-3, 2-1, 3-1, 2-3, 3-2). At, say $5 per bet, that's $30 on a race. Now let's say an exacta hits that pays $60 for a $2 bet. Since we bet $5, we've won $150 ($60 x 2.5). We invested $30 so we've netted $120 in winnings. That's a return on investment of 4-to-1 ($120/30). Hope this helps.